The study was aimed at developing and disseminating improved fertilizer recommendations, using the Nutrient Expert® (NE) fertilizer decision support tool, for the farmers of Nepal in collaboration with FORWARD, a leading non-governmental organization in Nepal, and the Non-Resident Nepalese Association of Australia (NRNA). Rice, maize, and wheat are the most important food crops of Nepal. The average yields of these crops are low and there is opportunity to improve the yield and profitability for farmers growing these crops through balanced and adequate use of plant nutrients. Blanket fertilizer recommendations for rice, wheat and maize in Nepal results in over- or under-use of nutrients, and poor overall nutrient use efficiency. To address the issue of improper fertilizer use among farmers, farmer participatory trials on the evaluation and transfer of Nutrient Expert® (NE)-based fertilizer recommendation were initiated for enhancing productivity of rice, maize and wheat in smallholder farms in the eastern Terai region of Nepal. 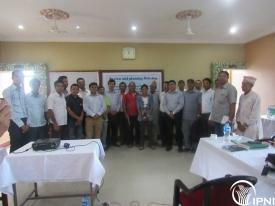 The current project was initiated to assess the Nutrient Expert® (NE) for Maize, Wheat and Rice in the Eastern Terai region of Nepal for improving yield and profitability of farmers through site-specific nutrient management. Two villages in Jhapa DIstrict (Gauradaha and Dhukurpani-Damak) and two villages in Morang District (Itahara and Babiya Birta) of Nepal were chosen for the current study. The soils of the area are slightly acidic, with low to medium organic carbon content. 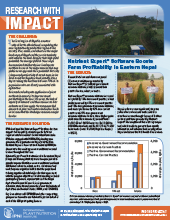 Nutrient Expert® Software Boosts Farm Profitability in Eastern Nepal Balanced and adequate application of plant nutrients is essential to improve cereal productivity in the Terai region of Nepal. IPNI developed the Nutrient Expert® fertilizer decision support tool to quickly estimate specific fertilizer requirements for cereals at the individual farm scale. The adoption of this tool will enhance food security within Nepal and secure the livelihoods of its farmers.